Agnil and the Wizard’s Orb – We have lift off! More exciting than the launch of the Apollo 11! Even more thrilling than a Thunderbirds launch! Yes, it’s the official launch of Agnil and the Wizard’s Orb! Now available from Amazon, Barnes & Noble and right here! Be among the first to read this exciting new adventure for Agnil! Agnil and the Wizard’s Orb – cover and blurb! Half-elf, Agnil, is struggling to fit into her human world and runs away from a bully at school. But life is difficult for her elf family too. Badly treated by the Boreans, the elves are stuck in a frozen world where the sun never sets. Can Agnil discover the power within her to save them all? Cover for Agnil and The Wizard’s Orb, book 2 of the Agnil’s Worlds series. 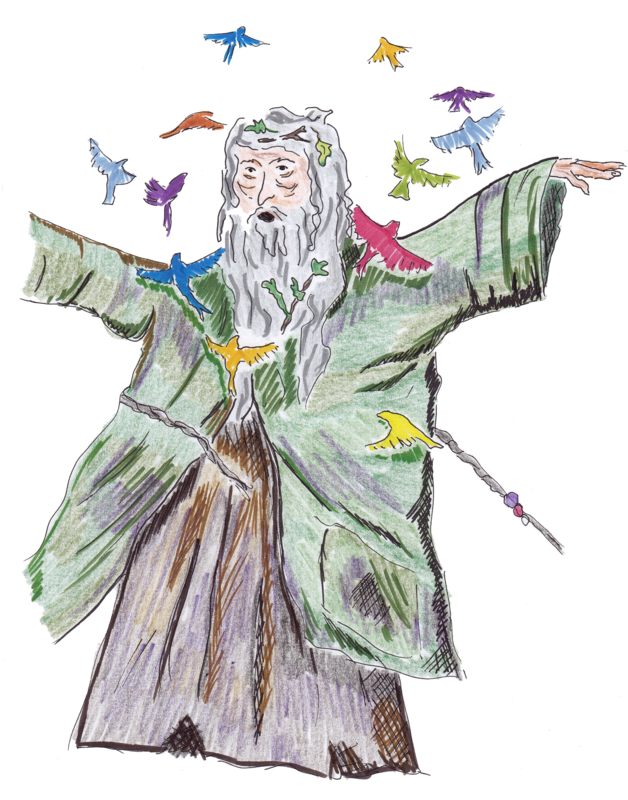 Cranus lifted his arms like two branches above his head and a flock of small birds appeared from beneath his cloak. With the cover more or less finished and the book ready for conversion to ebook, we are now very close to release. For today’s illustration reveal I have chosen one of my favourite characters, and I hope he’s one of yours too! I won’t be releasing any more illustrations now until the cover reveal. Enjoy!